Archbishop Edwin F. O’Brien is requesting prayers for Bishop F. Joseph Gossman, Bishop Emeritus of the Diocese of Raleigh and a former auxiliary in the Archdiocese of Baltimore. According to an archdiocesan spokesman, Bishop Gossman suffered a brain hemorrhage several weeks ago in Raleigh and has been hospitalized several times. Bishop Gossman, 80, served as an auxiliary in the archdiocese from 1968 to 1975, when he became Bishop of Raleigh. He held that assignment until his retirement in 2006. Born in Baltimore and raised in the Shrine of the Little Flower Parish, Bishop Gossman was educated at its parish school, St. Charles College in Catonsville, St. Mary’s Seminary in Baltimore and the North American College in Rome. He was ordained in 1955, served several parishes and was appointed assistant chancellor by Archbishop Francis P. Keough in 1959. Cardinal Lawrence Shehan elevated Bishop Gossman to chief of judge of the Tribunal and vice chancellor in 1965, when he was named a monsignor. In 1968, at age 38, Bishop Gossman became one of the youngest bishops in the United States. 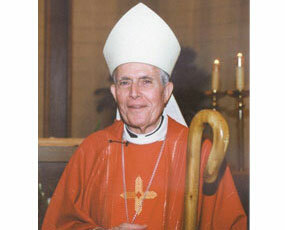 Archbishop O’Brien was alerted to Bishop Gossman’s condition by Bishop Michael F. Burbidge of Raleigh. Letters and cards can be sent to Bishop Gosman, care of the Chancery, Diocese of Raleigh, 715 Nazareth St., Raleigh NC, 27606.